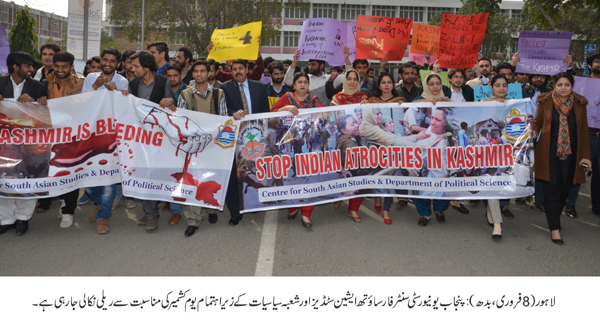 LAHORE: (Wednesday, February 8, 2017): Punjab University Institute of Communication Studies, Centre for South Asian Studies and Department of Political Science have organized rallies to express solidarity with the people of Indian Held Kashmir. 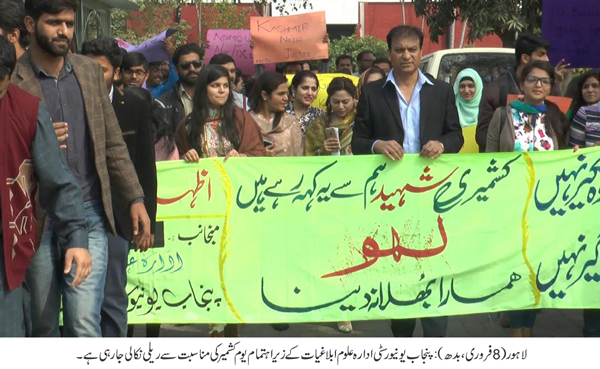 Prof Dr Umbreen Javed, Dr Iram Khalid, Savera Shami, Dr Amir Bajwa, senior faculty members and a large number of students participated in the rallies taken out from their respective departments. 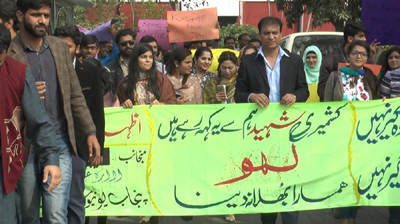 The participants were holding placards, banners and posters inscribed with slogans condemning atrocities going on in the Held Kashmir. The participants expressed the resolve that Kashmir would be liberated from the occupying forces. They called upon the international community to take serious notice of atrocities in Held Kashmir. They called upon the United Nations Organization to implement its resolutions. They said that Kashmiris must be given their right to plebiscite.